Home / News Release / Member News: Obituary for Angelina Gloria Bruno Manno, Co-Owner of Southland Printing Company, Inc. 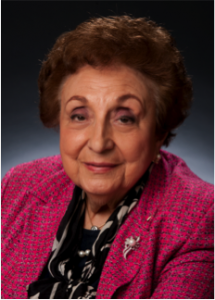 Member News: Obituary for Angelina Gloria Bruno Manno, Co-Owner of Southland Printing Company, Inc. The following is the obituary for Angelina Manno, Co-Owner and Secretary/Treasurer for Southland Printing Company, Inc. Angie, along with her husband John A. Manno, Sr., was involved in the parking industry since the early 1960s and has many friends and acquaintances in the industry. Angelina Gloria Bruno Manno, 86, beloved wife, mother, grandmother and great-grandmother, was called home by her heavenly Father on Sunday, February 19, 2017. She will be dearly missed by family, her “Southland Family”, friends, the Citizens of the Shreveport-Bossier Community and business acquaintances. She joined forces with her husband John A. Manno, Sr. in 1960 to launch Southland Printing Co., Inc. to serve the ever expanding needs of the Parking Industry. Over these 57+ years she served as the corporate Secretary and Treasurer. In December of 2013 she also assumed the role of mentor and business advisor to her son John A. Manno, Jr.
Angie was very active in the operations at Southland Printing and attended many industry conventions throughout the years. She loved extending “Southern Hospitality” to customers and vendors visiting our plant in Shreveport, as well as making sure the employees at Southland were treated to donuts, cakes, and delicious food at the many company celebrations which she planned. She will definitely be missed but the values and standards established by both Angie and Johnny will be carried on by John Manno, Jr., Jay Manno and her “Southland Family”.